In honor of the 75th anniversary of the Caldecott Medal, I decided to theme all of my preschool storytimes around Caldecott winners and honor books. 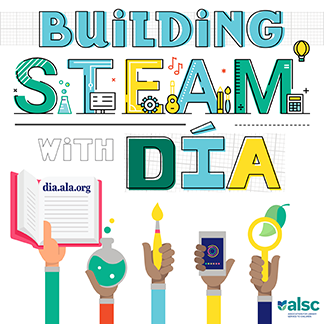 I was inspired by all of the Caldecott promotion that ALSC has been doing and wanted to do something to celebrate at my library. At first I thought I would be able to put together some storytimes just for January to highlight some past winners and promote the titles that were chosen this year. I got a bit carried away once I started looking at the list of Caldecott books and decided I could do more than a month worth of storytimes and I ended up with 15 weeks of Caldecott plans. Blackout, and Kitten’s First Full Moon) and Silly Animals (Click Clack Moo, Interrupting Chicken, and Don’t Let the Pigeon Drive the Bus). Once I had my books chosen, I filled in the rest of my storytime plans with songs and rhymes, sometimes themed with the books and sometimes just a song for fun because not everything always has to match. I then came up with extension activities and crafts for each of the storytimes since our storytime plans include an activity time at the end of each session. At the beginning of each storytime, I give the kids and parents an overview of the books we’ll be reading. I tell them about the Caldecott Medal and point out the shiny stickers on the books we have in storytime that day-this part is always exciting and the kids love pointing out the sticker. I explain that each year for the past 75 years a committee of librarians reads and reads all the picture books that are published during the year and that each January they decide which picture books have the best illustrations. I then tell them about the books we’ll be reading and ask them to look at the pictures and decide if they think the pictures are really good. 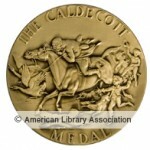 storytimes have gone on, the kids have become more involved in learning about the Caldecott Medal. Now at the start of each storytime, I ask what award our books have won and they excitedly yell out, “The Caldecott Medal!” impressing all the adults in the room. The more we’ve talked about the winning books in storytime, the more they’ve pointed out details in the pictures. When we read King Bidgood’s in the Bathtub, they had fun pointing out everything they saw in each picture. When we read Frog Went A-Courtin’, the kids pointed out how some pictures were in color and some were in black and white. And when we read Green and Joseph Had a Little Overcoat, they were very excited about pointing out where all the “secret cut outs” were on each page. After another storytime I had twin girls approach the desk asking for, “Books with the shiny stickers on them.” I took them over to the Caldecott display and they each took home a Caldecott title. Their mom said that they have become very excited about reading the award books thanks to storytime. I even had a parent thank me for using the Caldecott books in storytime because she wanted to purchase some of them for her child’s book collection and she liked reading them in storytime to see which ones her child enjoyed. Medal. I’ve loved talking about the winning books with the kids, seeing them get excited about discovering more Caldecott books, and hearing their thoughts on the illustrations in each book we read. It’s been such a fun storytime plan that I can’t wait to do more Caldecott storytimes. 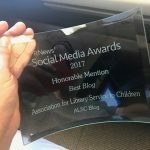 What a great idea– and thanks for the link to your Caldecott Storytime plans! Can’t wait to explore and see the pairings you made. I agree with Angela. A wonderful way to promote worthy books. I’m glad your plans were so appreciated. Thank you both! They have been so much fun to put together and the kids have really loved them. This is so inspiring! I am definitely going to be incorporating these ideas as I start doing my library’s preschool storytimes. 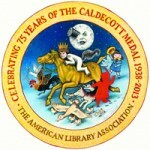 Kudos to you for promoting the Caldecott in such a great way, thanks for sharing the info!